Dr.Explain can write software help and documentation fast and without exhausting text and image formatting. Dr.Explain captures windows from a live application, creates screenshots and automatically adds references to all controls : buttons, edit fields, options, dropdown lists, and other items. Just add some description. 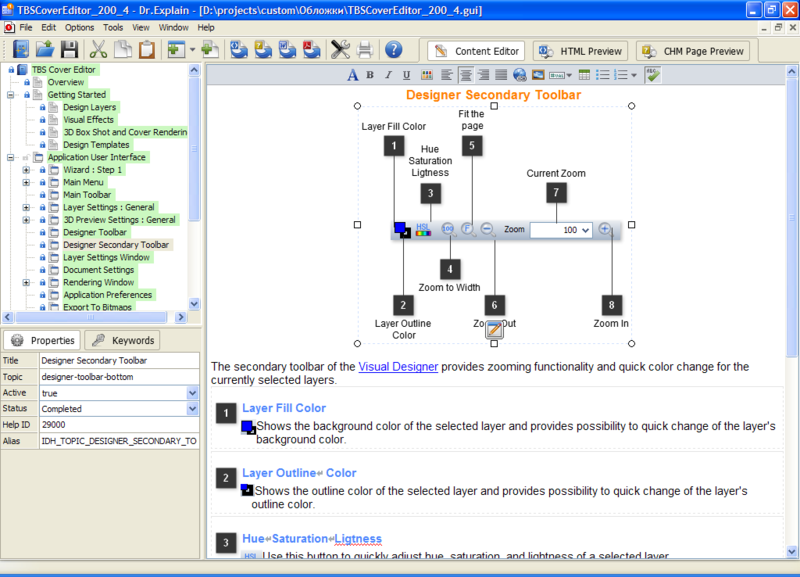 Export a project at once into RTF, PDF, CHM, or HTML help files with screenshots, color callouts, menus, and index page. ...... document complete with screenshots, cross-references, menus and an index page. The output is accurate and professional. Dr.Explain is ideal for software developers, ISV, micro ISV and technical writers. Dr.Explain handles all the complexities of help formatting and generation, allowing them to concentrate on pure writing. This saves them days that would otherwise be wasted. Dr.Explain is also great to keep help documentation in sync with software updates. Since all data is stored in a single source file, developers can easily edit or update any portion of an existing file. In doing this, they are not required to rearrange the entire help or generate a new file. Developers will also benefit from the opportunity to customize the appearance of their help file to make it match their corporate style. They can customize its visual elements, menus and page layout. On top of all this is an affordable price, which is lower than with the majority of other software documentation tools. Qweas is providing links to Dr.Explain 4.7.613 as a courtesy, and makes no representations regarding Dr.Explain or any other applications or any information related thereto. Any questions, complaints or claims regarding this application Dr.Explain 4.7.613 must be directed to the appropriate software vendor. You may click the publisher link of Dr.Explain on the top of this page to get more details about the vendor.